I kindly ask that everyone take a step back for a moment. Think about what has been going on in country music over the last couple of decades especially the last say five years. The complete erosion of the foundation of what makes country so unique and special particularly in the mainstream. Florida Georgia Line and Bebe Rexha currently have the number one song in country music with the disastrous pop song “Meant to Be.” Last year “Body Like a Backroad” an r&b/pop song was the biggest radio hit of the year. And I can go on and on with examples of just how bad things have gotten like I dunno the Backstreet Boys having a big hit on country radio. Sure there are plenty of quality independent artists out there that do a terrific job at making genuine country music. But for so long, classic country fans and fans of older country styles such as countrypolitan have had very few options. You see, country music is a genre of music that is so special in part because of its ability and desire to honor the roots of the genre. Of course, the idea of “real country” is not limited to a 1950’s style of music but gosh darn it, it is refreshing and cool to hear an album like this in 2018. Besides the sound of country music, throughout country music’s history similar stories of love and hardship are seen throughout. Its because these ideas are timeless and do not change with time even as the sounds of the music and place in history does. It doesn’t mean that a song isn’t creative or innovative just because it draws from past songs. I have seen countless criticism of this album across blogs, comment sections and Twitter, some of which is fair but some of it is not. The criticism is centered around but not limited to the fact that Josh Hedley is taking us back to a different era of country music with this album. This is from the past! People don’t make music like this anymore! How exactly is that a criticism? Many people including myself criticize mainstream country music for not honoring the roots of the genre and for pushing the boundaries beyond anything resembling country music. So when an artist like Josh Hedley comes along and makes a unique album (for 2018) with quality material, great vocals and an authentic throwback country sound he gets hammered? I don’t hear that same criticism of other traditional sounding country artists whose sound can be traced back decades. Shouldn’t that same criticism in turn be applied to Jon Pardi for his current single “She Ain’t In It?” Doesn’t it sound too much like that George Strait sound from 20 years ago? But you won’t hear that criticism will you? What it comes down to here is that there is a bit of hypocrisy afoot when it comes to criticizing Hedley for his throwback country sound. Country music has evolved over decades while continuing to honor the past and in many cases, the music from many great artists sounds like it would find a place in other decades as well. The idea that this album can’t be creative because of its throwback sound is to me ridiculous. And this brings me to the point of why we can’t have nice things in country music. No matter what an artist does they will be criticized in some shape or form. Remember when the Zac Brown Band came out with their album Jekyll and Hyde and it included a number of bad EDM inspired songs? They were criticized as they should be but when they turned around and recorded a back to roots style album it was dismissed and ignored. 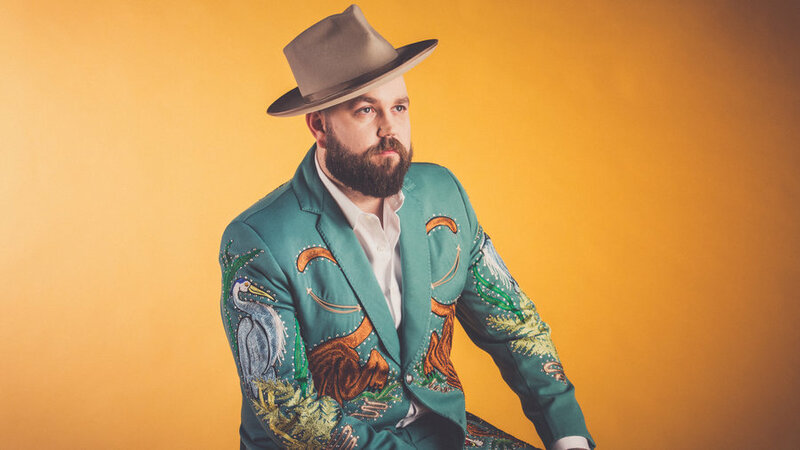 Maybe it isn’t an album of the year candidate, but Josh Hedley’s new debut album Mr. Jukebox is a solid, true country album that he should be proud of. There’s nothing wrong with honoring the traditions of country music by playing a style of music that has gone all but extinct. More than one style of country music can be welcome at the same table. Is it so wrong that countrypolitan fans have an artist they can hold on to? Josh Hedley should continue to make country music that comes so naturally to him. He can’t and won’t please everyone. Continue to grow as an artist and prove that there is an audience for this style of country music. I really like this one, too. I’m fine with others having different opinions, but I grew up hearing my parents’ records from the 1950s-70s, so this is great nostalgia for me. Country music really does include a wide variety of different styles, which were popular at different points in time. There were hillbilly string bands, western campfire songs, blues-influenced country from Jimmie Rodgers through Hank, Sr, western swing/cowboy jazz, countrypolitan, rockabilly, folk-country, Bakersfield, country-soul and country-R&B, outlaw, pop and disco country, country-rock, Nashville Sound, and on and on and on. And it’s perfectly valid to like or dislike some or all or none of these, and still be an avid country fan. Whenever I hear someone say they like only “real” country, I do sort of roll my eyes, because there’s no consistent definition to it. Ok so I’m going to respond the best I can although the first comment was a little confusing. The point of this post wasn’t to chastise anyone for disliking this album/style. There are some criticisms of this album that are perfectly valid even if I don’t necessarily agree with them. The point was that to criticize Hedley and this album strictly because you don’t think that by playing this style of country you can be innovative and creative is a poor argument. You also mentioned that if you didn’t grow up on this style of country it wouldn’t be for you and although that might be the case for you it wasn’t for me. I didn’t grow up on 50’s or 60’s country but I can appreciate the classic country style and this effort in particular. That’s really just a matter of preference though which of course is completely subjective.